Long was I asked to check out Falling Skies, and you know what? Eventually I did. Falling Skies is a sci-fi series that takes place in America 6 months after an Alien invasion has left the majority of the world dead or imprisoned. Tom Mason is the 2nd in command of a section of a resistance army fighting back against the alien invaders and a former history of war lecturer (as everyone is keen to remind you constantly). First in command is Captain Weaver, the two don't always see eye to eye as Weaver sees the civilians travelling with them as a burden, whilst Tom recognises they are vitally important for morale. During the initial attack children were captured by the aliens and turned into worker drones via a method that involves affixing an alien parasite to their backs (these kids are known as harnessed, thanks to my belligerent friend for reminding me of that terminology). One of these harnessed kids happens to be one of Tom's own. 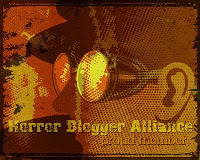 Fighting a battle against a seemingly unstoppable occupying force what can the resistance army really do? It isn't hard to recognise that this show must have had quite a small budget. Most the huge set pieces occur off screen, the CGI on the enemy mechs is not fantastic, and to be honest not a lot really happens and occurs on the same sets. To say I loved the show would be a lie, but I did keep wanting to come back. 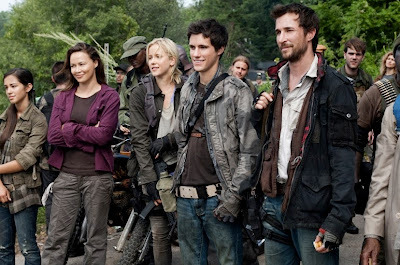 I found Falling Skies to be quite relaxing, characters sit around talking, occasionally fighting the odd Skitter (an insectoid type alien; these and the bipedal mechs make up the majority of the alien invaders). The first 7 episodes followed this format, there were no huge twists or turns, nothing much happened much at all but it was comforting following these mostly likable characters each episode. The final 3 episodes were amazing, the plot twists and action sequences completely over took anything that had happened previously and I found myself wishing the whole show had been that way, I was glued to my seat and finished the season chomping at the bit to see season 2. The enemy design is not bad, I wish there was more in the way of set pieces, usually only one or two enemies are encountered at any time, a few episodes revolve around human enemies which gives some nice variation (and saves some budget no doubt) but the big question is how likable are the main cast? Tom is an ok character, he is not fantastic and as the season progressed he looked more and more like a ruddy faced clown; I have no idea why but he seemed to be caked in blusher. Captain Weaver is played fantastically by Will Patton even if his role of a hard man with a secret soft heart is hardly original (love the almost unnatural friendship he has with child soldier Jimmy). Pope, the 3 sons of Tom, and the comically bland Asian guy are all kinda fun also. The female cast suffer quite a lot though. Toms oldest son Hal has a girlfriend who is captured quite early on, no big shame as she was too cocky for my liking, the groups Dr lady doesn't really do much despite having one of the main roles, there is an annoying as hell religious girl who spends the episodes preaching about having faith in God and on one occasion decides to start playing piano whilst the group are supposed to be hiding from enemies. There is one good female character Margaret so is not a total lost cause. 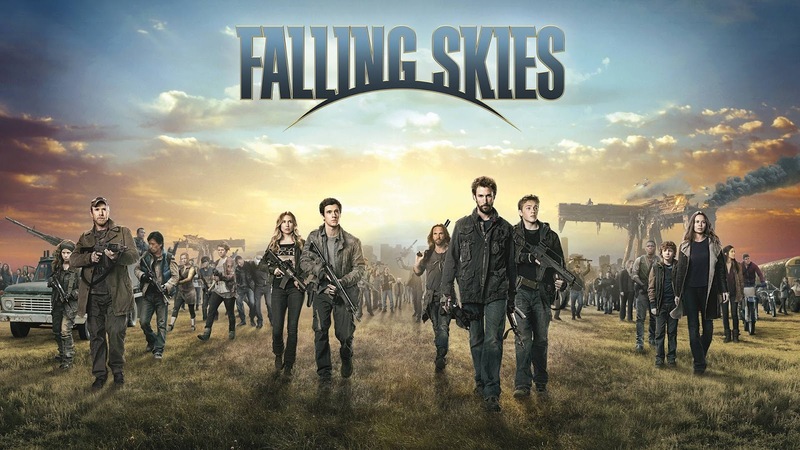 Falling Skies season 1 is not fantastic, but it is very watchable and never boring, there isn't a single bad episode and as I said the last 3 episodes are fantastic. Some may say skipping on the origin story for the events was a bad move but characters provide the back story, look forward to the 2nd season!